Mount Saint Awesome - 46: More Like T-Flex! Am I Right?! Seriously! 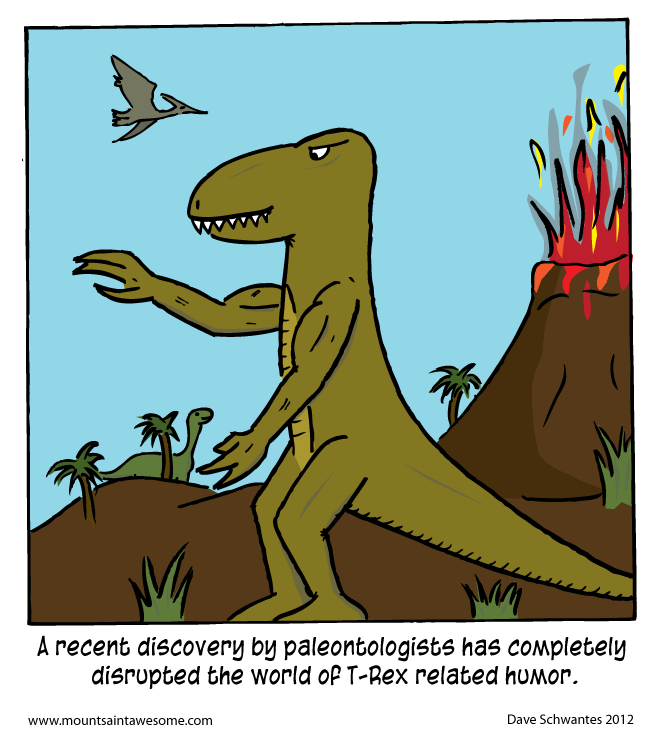 This type of ground breaking finding would throw the humorous dinosaur t-shirt market on it's head! Plus this would give T-Rexs the ability to hug, which is what I'm sure is what they always wanted to do. Wow I've been drawing a lot of comics about dinosaurs lately. I'm going to give that Ryan North a run for his money! Ok, sorry for all the missed updates. I've been traveling a lot and I just haven't been able to get comics finished. I know it's a bad excuse but it's the only one I have. Oh crap it isn't 2058 is it?